Chengdu is not only the capital of Sichuan Province, but also the economic and cultural center. Located along the southeastern reaches of the West Sichuan Plain, the city enjoys warm weather year-round, with an average temperature of 16 C. Chengdu has jurisdiction over 8 districts, 4 cities, and 8 counties, with an area of 12,390 square kilometers and a population of some 9.8 million. Throughout the long history of the city, it has also been called "Jincheng" and "Rongcheng". Chengdu has abundant tourism resources and a rich cultural heritage. Within its territory are 6 key State-level and 33 provincial-level cultural relics reserves. With the city at the center of a transportation network, 10 State, provincial, or city-level scenic resorts have been developed, including Dujiang Weir, Mount Qingcheng, and the Baoguang Temple. In addition, there are more than 20 natural landscape attractions, including parks, botanical gardens, and zoos. The local ethnic minorities host several gatherings each year that display the unique charm of the region, such as the lantern festival, flower festival, water drawing off festival at Dujiang Weir, dragon-boat races in Xinjin and Jintang, and the Wangcong song contest held once each year. 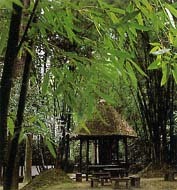 The principal scenic attractions in Chengdu are the temple dedicated to the memory of Zhuge Liang (a hero of the Three Kingdoms), the Humble Cottage of Du Fu (a great poet), Yongling Tomb, the Wangjiang Tower, Funan River, the Baoguang Temple, the Panda Breeding Center, Dujiang Weir, Mount Qingcheng, the Xiling Snow-capped Mountains, the Liu Family Mansion, the Shrine to the Goddess of Mercy, the Dragon Pool, the Huashuiwan Hot Springs, Mount Jiufengshan, Nine-Dragon Gully, Mount Tiantai, the Qingyang Temple, Mount Heming, and the Chunyang Shrine. Located in the largest bamboo park in China, Wangjianglou Park, the Wangjiang Tower is renown for its relics of the female poet Xue Tao of the Tang Dynasty. The principal structure in the park is the Chongli Pavilion, also known as the Wangjiang (Overlooking the River) Tower. It was reconstructed in the late Qing Dynasty. The four-story tower rises 30 meters from the banks of the river. The golden eaves, red pillars, and gold-plated roof provide an impressive view and has become a symbol of Chengdu. Du Fu was a renowned poet of the Tang Dynasty who lived from 712 to 770. A recluse, he built a humble cottage in the western outskirts of Chengdu. Now a tourist attraction, the Humble Cottage includes a grand corridor, epic hall, brushwood door, the Du Fu Shrine, and a pavilion built over the foundation of the original cottage. Located in the southern suburbs of Chengdu, the Memorial Temple of Zhuge Liang occupies an area of 37 square kilometers. Early in the Ming Dynasty, the hall was merged with a neighboring temple dedicated to Zhaolie Emperor Liu Bei of Shu Kingdom. This explains the ancient plaque hung over the gate to the temple, which reads, "Temple of Zhaolie Emperor."